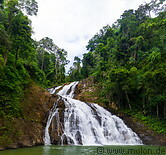 A number of waterfalls are located along the Selai river, a few km north of the Selai forest camp. There are a number of forest trails which connect these waterfalls to the forest camp. Some of these trails are quite decent, others are very steep and slippery. One of the trails has sections consisting of a steep slope of mud, which becomes very slippery when it rains. Park rangers have fixed ropes along these steep trail sections, which allow visitors to get through these sections. All of these trails are heavily populated by leeches, making leech socks or another leech protection essential. 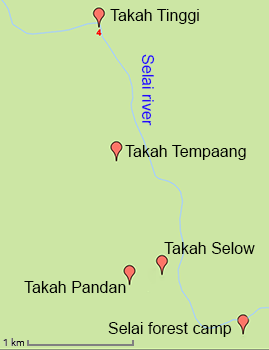 Walking along the river towards the north, the first waterfall, Takah Tinggi, can be reached after 1:30 hours. Takah Tinggi is a wide, multiple section waterfall which ends in a large pond. Walking back along the river to the south visitors reach the second waterfall, Takah Tempaang, after about 45 minutes. Takah Tempaang is a not so tall two section waterfall which ends in a pond. From Takah Tempaang trekkers walk further south along the river towards the Selai forest camp, at one point turning right and alking up a slope. After another 45 minutes of walking people reach the Takah Selow waterfall. This is a small, but nice waterfall where water pours down a rocky cliff. Trekkers then continue walking up the slope for another 25 minutes. This part of the trail is very steep and slippery. Finally people reach the majestic Takah Pandan waterfall with a more than 50m high fall. Also at the bottom of this waterfall there is a small pond. From the Takah Pandan waterfall it takes a bit over half an hour to reach the Selai forest camp. For all these trails good footwear and leech protection is needed, as well as sufficient stamina. Amphibian shoes are not essential, but would enable trekkers to take shortcuts and reach spots which require crossing rivers and ponds.